President Xi Jinping commended Shandong province and the coastal city of Qingdao for successfully hosting the Shanghai Cooperation Organization summit. Observers from around the world have been paying close attention to the keynote speech delivered by Chinese President Xi Jinping at the just-concluded Shanghai Cooperation Organization(SCO)summit. 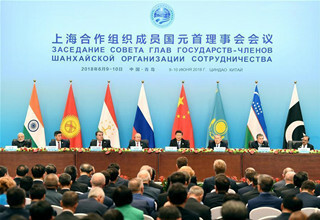 The Shanghai Cooperation Organization Summit in Qingdao, which concluded with "the most fruitful outcomes" in the history of the organization, will be a "new landmark" in the organization's development. The city of Qingdao, Shandong province, which hosted the 18th Shanghai Cooperation Organization Summit over the weekend, has become an essential hub linking China with other SCO member states.